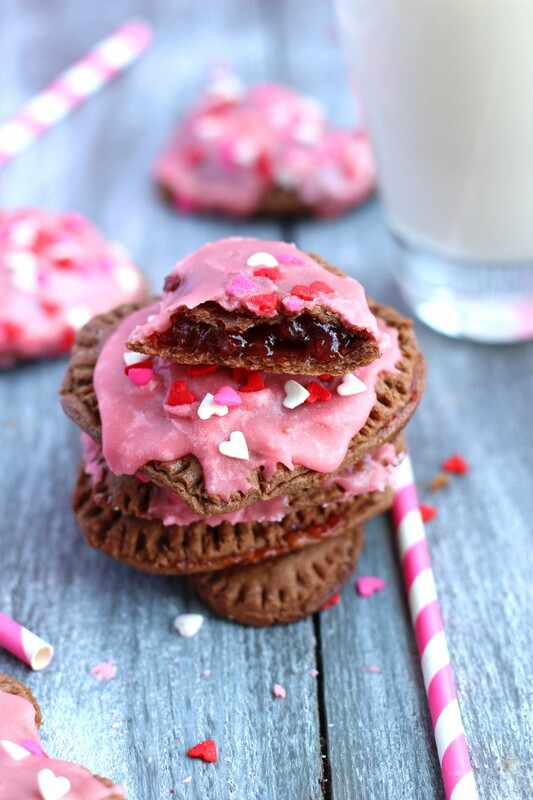 A chocolate flavored pop-tart with a strawberry & nutella filling. The top is covered in a pink-dyed glaze and decorated with heart sprinkles. Start with the crust. Combine the flour, sugar, salt, and cocoa powder in a large bowl. Stir together with a fork. With a pastry cutter, or two knives, cut in the butter until the pieces are very small (size of peas) and butter is well incorporated in the mixture. Separate the egg - place the yolk in a small bowl and the whites in another small bowl. Using a fork, beat the yolk with the heavy cream for about 20 seconds. Stir in the egg + heavy cream mixture with the flour mixture. Wrap the dough in plastic wrap and place in the fridge while you work on the filling. Combine the strawberry jam, lemon juice, and almond extract in a very small pot over low-medium heat. Stir. In a small bowl, whisk together the cornstarch and water until the cornstarch is completely dissolved. Slowly add the cornstarch to the jam mixture and whisk. Let the mixture simmer over low-medium heat for about 7 minutes, stirring occasionally. Remove from heat and let stand while you roll out the dough. Melt the butter and combine it with the powdered sugar. Stir until combined. It will be thick and dough-like. Add in the vanilla and food coloring and stir again. This glaze is supposed to be very thick. It will melt to the perfect consistency on the warm pastries. Roll out the dough to 1/8th an inch thickness (very thin!) Using a heart cookie cutter, cut out as many pieces as you can. Then combine the dough and re-roll continuing to cut as many hearts as possible. Spread a layer of nutella on half of the cut-out hearts. Top with about 1/2 tbsp. or a rounded teaspoon of the jam mixture on each heart. Make sure to spread the jam mixture so the heart is filled with it, but making sure to avoid the edges, Place another heart cut out on top, and crimp the edges with the end of a fork (otherwise the mixture will ooze out). Remove from the oven and transfer to a wire cooling rack. Let cool for one minute and then spread the glaze over the pastries. The thick glaze with melt and top the pastries perfectly. Top with sprinkles and let cool completely. *Tip: mix some flour with cocoa powder to flour your surface so your pastries don't have weird coloring. Thank you so much Kelly! 🙂 Hope you are having a great weekend! Ok, you’re gonna judge me….I currently have two boxes of poptarts in my pantry: Funfetti Cake and Chocolate Chip Cookie dough. Yes, I eat them on a weekly basis. BUT only right after I workout so it doesn’t count 😉 Healthy? No. Delicious? Um yes. But, I have actually been wondering how to make my own, so this is a perfect recipe lady! These look so delish and ya, definitely need to wait for those to cool down! I am still victim to the poptart mouth burn every. single. time. Haha oh gosh, I love it Taylor! After a work-out is totally acceptable 🙂 haha. and Funfetti cake = the best poptart flavor ever! Mouth burn- I’ll never learn either. Obviously! I’m in no position to judge, Chelsea, I just ate pie for breakfast! 😉 Love the strawberry + Nutella combo!!! LOVING all your sweet treats!!! 🙂 I used to love pop tarts too in middle school and high school, but haven’t touched them since, these are totally taking me back!! Thank you so much Nicole! 🙂 We should trade – I’ll send you some poptarts for your yummy soup you posted today! Ha, I wish! Yea…as much as I hate to admit it, Poptarts were my go-to lunch of choice in high school when I forgot to bring lunch from home as well. Now that I’m a bit older though I can’t eat them without squirming because of that lovely list of chemicals…I mean ingredients haha. I guess I’ll just have to try these out then! I’m sure they taste a lot better than the originals plus they’re so much prettier :). haha you are definitely not the only one! I used to eat pop-tarts like it was my job in middle and high school. The cinnamon sugar one was my favorite! I love this homemade version – and with the nutella and strawberry – so perfect for valentine’s day! Have an awesome weekend Chelsea! Hahahaha! Crack me up – “like it was your job” !! Okay, glad I’m not the only one ha! Thanks Ashley, hope you have a great one as well! Thank you so much Kelly 🙂 Hope you have a great weekend! These little poptarts are so cute!! I ate my fair share of poptarts when I was younger, then didn’t for awhile, and started again in college. Because I could use my student card to buy them, haha. The brown sugar cinnamon ones were my jam. 🙂 I am so impressed with your chocolate crust and strawberry and nutella filling! So much better than any of the store-bought flavors! I love pop-tarts! Definitely ate them from the vending machine!! I had not eaten them in years and then when I was pregnant I had to have some! 😉 these are super cute and lovely photos as always! As always, these are so cute!! I have to admit that I’m not really one to go for traditional pop tarts, but I could totally polish off a batch of these. Love the nutella and strawberry combination. I would love to add some pureed strawberries to the glaze for extra strawberry flavor. Have a great weekend, Chelsea! How darn cute are these?!?! And obviously, if Nutella is in the title, I’m so beyond in. Need these in my life!! Pinned. Oh, Chelsea, these are so adorable and delicious looking! I used to eat pop tarts ages ago but stopped buying them because of all the unpronounceable ingredients. I’m pinning these to try! These are SO cute and adorable!! Pinned! Pop tarts are a staple around here with kids. I have made home made ones a few times, but then I went back to buying the boxed ones. Maybe I need to start stuffing them with Nutella and cutting heart shapes because these are seriously so cute! And I love all the sprinkles. Thanks so much Jocelyn! And thanks for featuring them in the link party and pinning them 🙂 I really appreciate it! And especially when super big bloggers like yourself help out us little ones 🙂 Thanks again!